This DVD has captured many of The Florida Aquarium’s best exhibits. Relax and enjoy the beauty of nature, with scenes of serene jellyfish, playful clownfish, magnificent sharks and stingrays, graceful leafy sea dragons and stunning coral reefs. In true Plasma Candy fashion, each scene was shot from a fixed position to make your TV look like a clear window to an aquatic wonderland. Soothing Seascapes from The Florida Aquarium is guaranteed to enhance ambiance at your next gathering, at the office, or simply while relaxing at home. 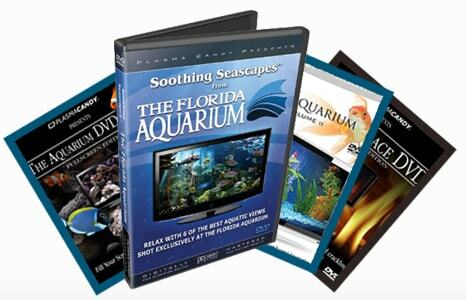 If you like what this DVD has to offer you will surely like the Aquarium DVD Vol 1 and Vol 2 as well.